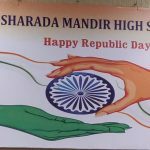 S. M. High School on 26th January, 2019. 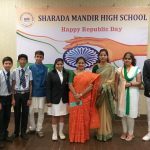 The entire school’s courtyard was resplendent in the shades of tricolour. The ceremony began with the hoisting of the tricolour, the pride of the Nation and singing of the National Anthem. The choir sang the patriotic songs which reverberated everyone with the feeling of patriotism. It was followed by inspiring speeches by the students on the significance of the occasion and Indian Army. 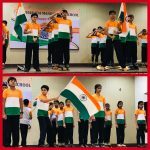 The band of the school played notes paying a tribute to the Indian soldiers. 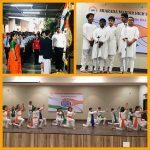 The remarkable presentation of the drama on today’s young generation, the synchronized movements of the skating and gymnastic presentation by the primary and secondary students left the audience speechless. 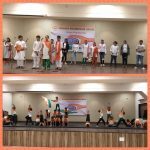 But the day did not stop here, each member in the audience was filled with enthusiasm and joy with the dance performance of 5th and 6th standard students. A vote of thanks was tabled by the anchors in the end. The students dispersed after snacks with the motivation to uphold the honour, integrity, uniqueness of the country and identify themselves as true Indians.